The Kurdish mother Daya conceptualizes on wet nursing, breast-feeding rather than motherhood (see Encyclopedia Iranica); compare Pahlevi dāyag, Avestian daēnu däyun. Daya is most probably from “do دو ” milk used in some Iranian dialects to replace Persian maadar: mother. The word daaya دایه still refers to a nurse in some oriental languages as children were or are still sometimes breast-fed by more than one woman. 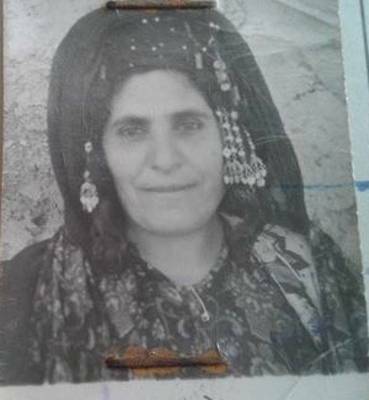 The Kurdish word mak for mother from matere is still preserved in Kurdish words like زگمك zigmak and ورگمك wirgmak where زگ zig / ورگ wirg (stomach / belly). The k in dayik is from Iranian –eke often added at the end compare also baawk father. The Kurdish word daya دایه goes back to the old Iranian dauxsh which referred to (sucking, suckleing, milking) (see Johnny Cheung: the etymology of the Iranian verb), Pahlevi verb (dwsh- / dosh-) meaning (to milk). The Kurdish Sorani verb doshin دوشین / Kirmanji دوتین is the process of milking coined by adding the suffix sh or x (to peck /nibble /breast-feed). This means the English daughter is a cognate based on the same milk concept which replaced the common Indo-European word filia, Proto-Germanic dokhter, German Tochter, Sanskrit duhitar, Avestan dugeda, Indo-European dheugh (to prepare) compare also English (dough) from PIE dheigh (build, form knead), Sanskrit dehah (to form). Thus the Kurdish mother is the breast-feeder, the builder, the former, the one who kneads her children. 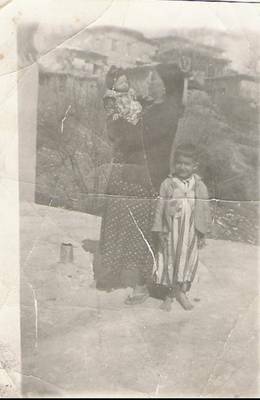 The image shows my mother (Miriam Xan) on the roof of what was a kitchen and a bathroom in Rwandiz with baby Kamaran and Pishtiwan. The image at the bottom is of my wet nurse, my second mother Haysha Jujki.